Store 20 X 20 grid in two-dimensional array and consider following 8 cases to solve this problem. When i < 3 && j < 3 - Get product of four adjacent numbers in right, bottom and bottom right diagonal side. When i < 3 && (j >= 3 && j < 17) - Get product of four adjacent numbers in right, left, bottom, bottom right diagonal and bottom left diagonal side. When i < 3 && j >= 17 - Get product of four adjacent numbers in left, bottom and bottom left diagonal side. When (i >= 3 && i < 17) && j < 3 - Get product of four adjacent numbers in right, bottom, up, bottom right diagonal and up right diagonal side. When i >= 17 && j < 3 - Get product of four adjacent numbers in right, up, up right diagonal side. When (i >= 3 && i < 17) && (j >= 3 && j < 17) - Get product of four adjacent numbers in right, left, bottom, up, bottom right diagonal, bottom left diagonal, up right diagonal and up left diagonal side. When i >= 17 && (j >= 3 && j < 17) - Get product of four adjacent numbers in right, left, up, up right diagonal and up left diagonal side. When i >= 17 && j >= 17 - Get product of four adjacent numbers in left, up and up left diagonal side. Now w.r.t each case we need to find greatest product in particular direction and finally we will get greatest product of four adjacent numbers in same direction (up, down, left, right, or diagonally) in the 20 X 20 grid. 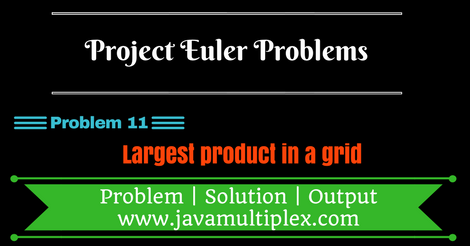 * @Problem 11 - Largest product in a grid. //Adding left,right,top,bottom,topRightDiagonal, topLeftDiagonal,bottomRightDiagonal,bottomLeftDiagonal side multiplication in an array. //Getting max multiplication from array. //Sorting list elements in ascending order. System.out.println("The greatest product of four adjacent numbers in the same direction (up, down, left, right, or diagonally) in the 20×20 grid is : "